December is here, so winter holidays are nigh. Send in the oranges! Better yet, pour the orange liqueur. The Netherland Cocktail overflows with seasonal cheer. And its base spirit is brandy, which excels at warding off winter’s chill. It’s a nice cocktail, indeed. But you may want to be naughty and have more than one. 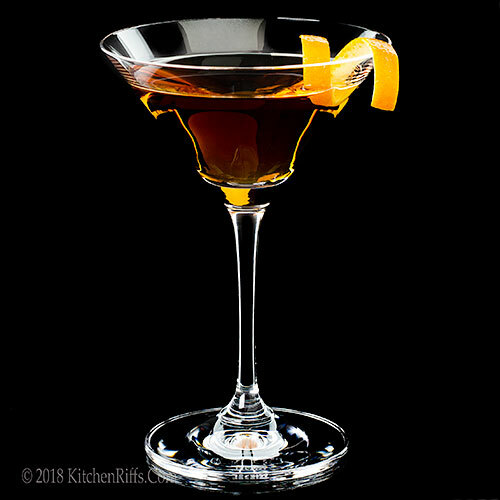 The Netherland Cocktail was created as the house drink for the New Netherland hotel, which opened in New York City (59th Street and Park Avenue) during the 1890s. In 1927, it was replaced (on the same site) by the Sherry-Netherland Hotel. We learned about this drink from reading cocktail historian extraordinaire David Wondrich. We have slightly adapted his recipe. This drink takes about 5 minutes to prepare and serves 1. Place all ingredients (except garnish) in a cocktail shaker half filled with ice. Stir (or shake – see Notes) until well chilled (20 to 30 seconds). Strain into a cocktail glass, preferably one that has been chilled. Garnish with an orange twist, if you wish, and serve. This drink also tastes great served over ice in a rocks (Old-Fashioned) glass. Stir or shake? The “rule” says stir, because all the ingredients in this cocktail are clear (shaking introduces oxygen bubbles, which can temporarily cloud the drink). But we shake anyway – it’s easier. Cognac is a type of brandy made in the Cognac region of France. Several good brands are available. Ask your friendly liquor store salesman for a recommendation. Or just use domestic brandy, as we do. It’s cheaper than cognac and works fine in cocktails. Grand Marnier is an orange-flavored liqueur of the curaçao type. 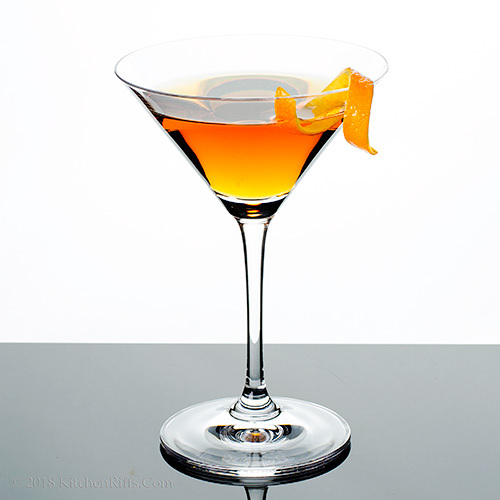 (The other style of orange liqueur is triple sec – an example is Cointreau). The flavors of the two liqueur types are somewhat similar, but curaçao is much sweeter. So you generally cannot substitute one for the other. Grand Marnier is a premium curaçao, and it’s a bit pricey. If you want to use something less expensive, try a generic orange curaçao. If you go this route, definitely ask your liquor store for a recommendation – the inexpensive brands of orange curaçao can sometimes be very sweet and cloying. 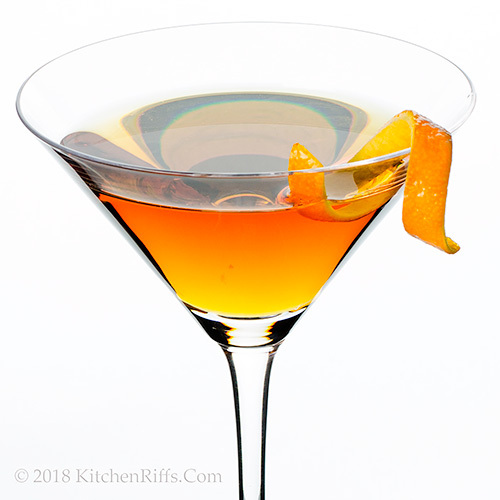 Speaking of sweet, you may want to adjust the amount of Grand Marnier (or orange curaçao) you use in this drink. David Wondrich recommends 2/3 ounce, though we find that a bit too sweet. But Wondrich also prefers serving this cocktail as an after-dinner drink. If you’re serving it that way, sweeter may be preferable. The best orange bitters we’ve tasted are the Regans’ and the Angostura brands. Orange bitters can sometimes be difficult to find, but a good liquor store will carry them. Or you can order them online. “Well I never!” I said. “That will never do,” said Mrs K R.
“And that will never fly,” I said. Unlike Mrs. Kitchen Riffs, I went straight to the Sherry-Netherland Hotel in my head when I saw the name, even though I didn't know the drink's origin. We tend to steer away from sweet cocktails—would substituting triple sec possibly work? Hi Terry, you could certainly give triple sec a try. Grand Mariner is definitely sweeter, but it also has a brandy base, so that cuts the sweetness some. But let me know how the triple sec turns out! Thanks for the comment. Lovely winter cocktail with the warmth of brandy! Love the addition of Grand Mariner as well! Perfect to sip on during the holiday season. Hi Liz, it's really a nice drink. Very sippable. :-) Thanks for the comment. You better beleive I will be naughty and have several lol. Love oranges flavors in drinks, this one looks exceptional for me! Hi Evelyne, this is an easy cocktail to be naughty with. For. Whatever. :-) Thanks for the comment. My free association: Curaçao-Dutch Antilles-Netherlands Cocktail. Not even close. The store where we used to buy liquor (anything more alcoholic than sherry) has gradually turned itself into a bar and lunch place. It now sells only a minor selection of wines and beers. We need to find out who sells cognac, liqueurs, etc! Hi Mae, curaçao did indeed originate in the Dutch Antilles, and New York, and the Dutch originally colonized New York, so your free association isn't that far off. :-) Thanks for the comment. Hi Tricia, not technically winter, but we've been getting snow! Thanks for the comment. Second, I am very impressed by how lovely all your photography is! I am not very skilled with taking photos of cocktails. It's surprisingly complicated in my point of view, although perhaps I'm just really missing some trick. In any case, I'll be a new subscriber! Looking forward to new recipes. Hi Chava, welcome! This is a good drink -- really worth trying. And photographing cocktails is hard, or at least I find it so. Remember, you're photographing the glass; the contents; and the garnish. And not necessarily in that order. :-) Thanks for the comment. A perfect cocktail to snuggle by the warm crackling fire... Wishing you and Mrs. Riff a super holiday season. Hi Bobbi, a warming cocktail by a warming fire. :-) Thanks for the comment. Yummy, the perfect cocktail for me. Maybe I will loosen up my book club with these cocktails next week. Count me in the naughty group. This sounds like a very warming cocktail for a cold winter's night! Hi Gerlinde, sounds like it'll be a fun book club. :-) Thanks for the comment. Hi Abbe, we're definitely in the naughty group. :-) Thanks for the comment. Sometimes you just gotta break the rules and give it a shake!! So very pretty and perfect for the holiday season! This sounds right up our alley. My husband is fond of cognac. I'm sure he will like it. Thanks! Hi Dahn, that's us -- rule breakers. And shakers and movers. :-) Thanks for the comment. Hi Angie, and really, really good. :-) Thanks for the comment. Hi Lydia, since your husband likes cognac, he'll definitely like this drink. It's a good one. :-) Thanks for the comment. Hi Kelsie it's grey here, too -- time to break out the cocktail shaker! :-) Thanks for the comment. Hi GiGi, I'll bet he does have all the ingredients. He should make one. :-) Thanks for the comment. Hi Karen, I've walked past the Sherry-Netherland hotel dozens of times (I used to work a ten minute walk from it), and it's a neat building. Never been inside, though. Looks really nice from the outside! Thanks for the comment. So blondy and beautiful! Cheers! Hi Denise, it IS blondy, isn't it? :-) Thanks for the comment. This is such a nice cocktail for the season...deep and soothing...I love the sweetness of Grand Marnier...thanks for the recipe John. Hi Juliana, soothing is always good! :-) Thanks for the comment. Yum, looks like orange juice but I'd better be careful and not quaff this cocktail down. We've got Cointreau in our usual stock of booze so this cocktail is raring to go! Hi Fran, this drink does have a bit of a kick to it, so it's a sipper, not a gulper. :-) Thanks for the comment. Yum. Perfect for the season. Hi Amalia, definitely yummy! :-) Thanks for the comment. Hi Greg, well said. No wonder Mrs KR's nickname for me is stupid! :D Thanks for the comment. Hi Frank, enjoy! :-) Thanks for the comment. Ahhh... to me this is the winter-sit-by-the-fire version of a sidecar. Time to restock the brandy and Grand Mariner. Thanks for this, John - wishing you and Mrs. KR a happy start to the holiday season! Hi David, if you like sidecars (one of our favorites), you'll like this, I'll bet. Really tasty. :-) Thanks for the comment. I love both Cognac and Grand Marnier, but have never had them together. Sounds delicious! I love that taste of bitter orange in cocktails. So much so that if I spot any drink with that characteristic on a menu, I will absolutely order it. Happy holidays! Hi Jeff, Grand Marnier actually has a brandy base, so you HAVE had them together. :-) Thanks for the comment. Hi Carolyn, orange in any guise is wonderful in cocktails. Heck, citrus in general is good. :-) Thanks for the comment. I was curious so I looked up the Sherry-Netherland Hotel. It's so beautiful! And so cool to know the history of the cocktail. One of them would probably be perfect for me, but it sounds so delicious that I might just be naughty. Hi Valentina, it's a neat hotel. We know it only from the outside -- love its location in NYC! And yes, you probably want to be naughty with this one. :-) Thanks for the comment. I'm willing to be on the naughty list if it means I get a couple of these cocktails! Orange liqueur and brandy sound lovely for chilly weather. Hi Lisa, being naughty has never been so rewarding! :-) Thanks for the comment. love your photos. and love the sound of this citrus-y drink. cheers! Hi Merryn, alas, even when I'm trying to impress people, it never works. :-) Thanks for the comment. Hi Sherry, cheers! :-) Thanks for the comment. What a wonderful winter warmer, perfect for the festive season. Hi Emma, this drink has terrific festive flavor. :-) Thanks for the comment. 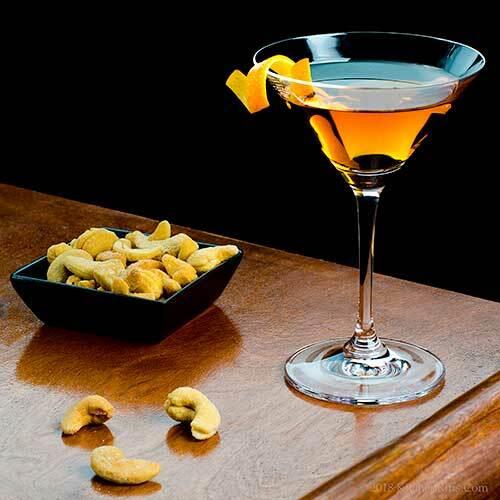 There are few things better than Grand Marnier. I know it would be great in this cocktail. I love the color of it! It looks and sounds great, John! A nice drink for this time of year and I would probably be naughty! Thanks for sharing! Hi Laura, this has a neat color, doesn't it? And fab flavor. :-) Thanks for the comment. Hi Pam, it's hard not to be naughty, isn't it? :-) Thanks for the comment. Sounds like a wonderful cocktail for the holidays. Love your pictures, as always. Hi Dawn, this drink really does seem particularly appropriate at this time of the year. Although I'd be happy to drink it any time! :-) Thanks for the comment. What a lovely citrus flavored drink! perfect for the upcoming festivities! Hi Katerina, isn't this nice? And so ideal for the season. :-) Thanks for the comment. Guess what I got in my stocking? Orange bitters (and bourbon cherries) for the perfect Old Fashion. Guess I will try those holiday bitters out for this cocktail. Thanks! Hi Debra, orange bitters are GREAT! :-) Thanks for the comment.